One of Faeria’s unique qualities is the power wheel. This gives the player access to building land which is an essential part of the game. Land is not the only option available in the power wheel. Players can also gain one point of Faeria or draw a card. Gaining an additional Faeria point will help you play more cards from your hand. Drawing a card is a very powerful option during your turn but it does come with consequences if not planned correctly. Using the Power Wheel for either these options will take a bit of practice. In this chapter I will help you identify moments where using one of these options could be better than placing land. 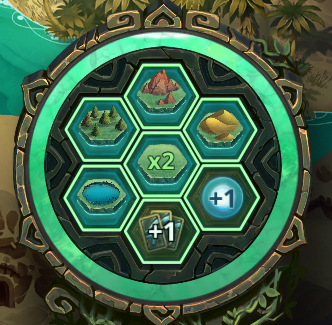 To start off with we will take about the Faeria button. There are two primary uses for gaining an additional Faeria. First to help pay for a card in your hand and secondly to help your Faeria economy. There will be occasions when you can’t afford a card in your hand you’re one Faeria off. The Power Wheel allows you to gain that extra Faeria and play your card. This can be used over multiple turns by taking that additional Faeria to play a powerful card. You produce three Faeria per turn but with the Power Wheel you can make that four Faeria per turn. In two turns at zero Faeria you can get enough to play a card with a cost of eight or less. This could be an important play to help you get back into the game. Faeria has a unique economy system because you don’t lose your resources at the end of your turn. Any Faeria you harvest or produce you can keep until spent. This is why harvesting Faeria is so important because you can store the Faeria until a rainy day. At some point in the game you’re going to have the lands you need and can then either draw a card or gain Faeria. One thing to consider is what you have in your hand already. If you have a couple of creatures that you know you want to play in the next few turns you won’t need to draw a card. In this match I already have three creatures and one event in hand. I have three Faeria and no harvesters. My Groundshaker is taunted so he can’t harvest Faeria for me. Taking Faeria here could allow me to play a creature plus an event in one turn. Taking an additional Faeria in those situations will let you play more cards per turn which can be necessary if you have to play re-actively. Review the quality of your hand before considering taking a draw, gaining Faeria might be more important. Identifying the correct moment to use the power wheels non-land functions is sometimes difficult. There are many aspects into knowing when to draw a card. Drawing a card offers you a potential alternate play for your turn. However don’t use the button to quickly, take a few things into account first. Before drawing a card you could analyse the board and see if you will need lands in order to defend or continue your offence. I’ve witnessed players in tournaments draw out of desperation when in fact they needed to produce land to slow down their opponent. Identify what your opponent wants to do next turn. Does your opponent want to build land? Could you stop them from gaining an aggressive land next to your well? How does this affect the long game? If you’re confident land or additional Faeria won’t help you this turn then you can go for a draw. It is always best to figure out what you’re going to do with your power wheel at the start of your turn. If you discover that you don’t need land and can draw then you want to have that card at the beginning of your turn. That card you drew could completely change how you want to play out your turn. You don’t want to make a play then draw a card and find out the card you drew was a better line of play. Drawing is a good way to extend the game and buy you time. When you know every card in your deck you will understand what options you could draw. In this example my 4/3 Horsemaster is threatened by the Mirror Phantasm. My deck does have three Flame Bursts in my deck. Drawing into a Flame Burst would allow my Horsemaster to continue hitting my opponents Orb uncontested. You can use the draw button to find a creature to play. Sometimes your hand might have creatures but they cost too many lands. Drawing a creature to play is a risk because it stops your land development to play other cards in your hand. However if you’re up against a rush player you might not have the time to wait for high land cost creatures. The draw button is a way to capitalize on being ahead in a match. If you’re in control of the board then drawing a card is a strong way to give you more options to further shut down your opponent. A deck that is very effective with this strategy is Yellow Rush. Once you get your aggressive lands you can keep drawing cards to find more ways to finish the game. Yellow Rush doesn’t need to create a lot of land and benefits tremendously from the draw button. Using the Power Wheel is a skill in its own right. Analyzing the use of your draw and Faeria button can be a rewarding practice. It will help you identify when these options are a necessity, a luxury or a mistake.